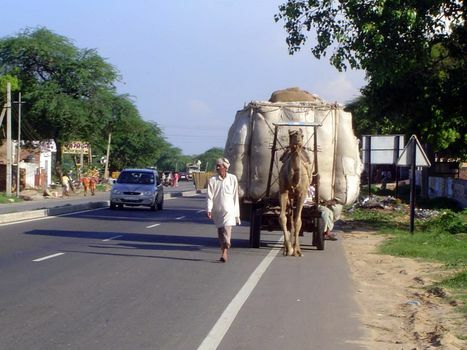 The premier attractions of North India--overrun with visitors but still magical. 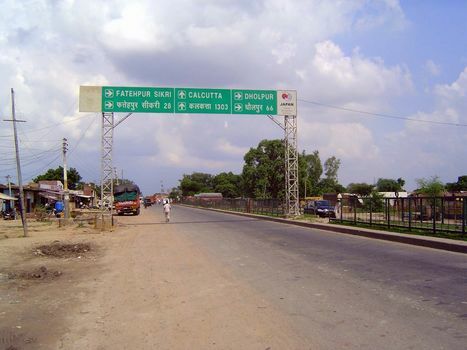 We'll begin with the much improved highway from Delhi to Agra. Calcutta, anyone? 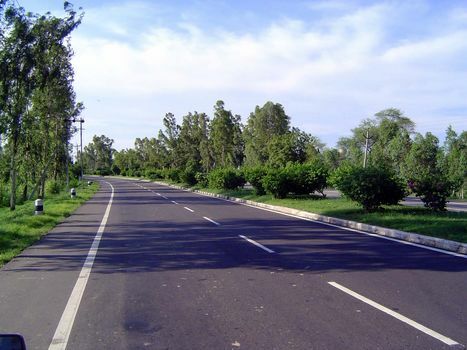 You have to drive a while in India to appreciate just how long a drive 1300 kilometers can be. There's no minimum speed limit on the road, but in this case at least the carter is on the right side: many aren't. 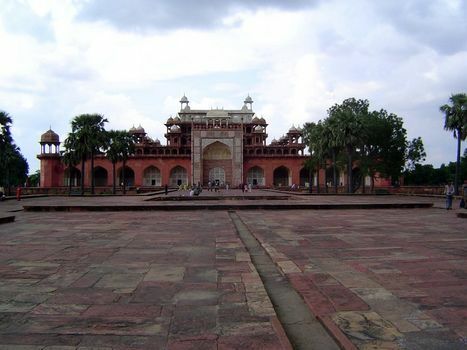 Akbar, who ruled from 1556 to 1605 (the longest reign of any of the Moghuls, although Aurangzeb came close), is buried on the outskirts of Agra, at Sikandra. 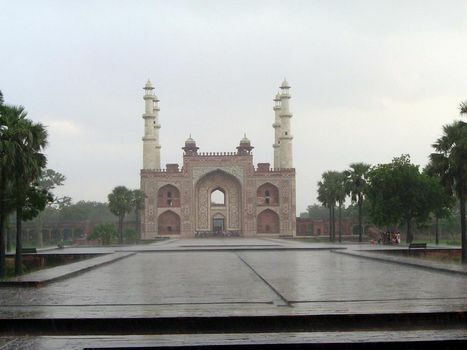 Here's the entrance to the immense courtyard surrounding the tomb. 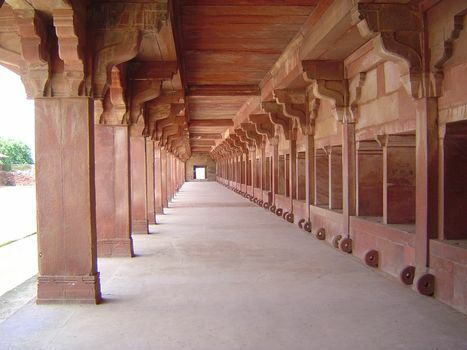 Akbar had a fondness for red sandstone, but you can see the beginnings of the trend to marble which reached its apogee with Shah Jahan and the Taj. The cenotaph rests at the top and on a level closed to the public. 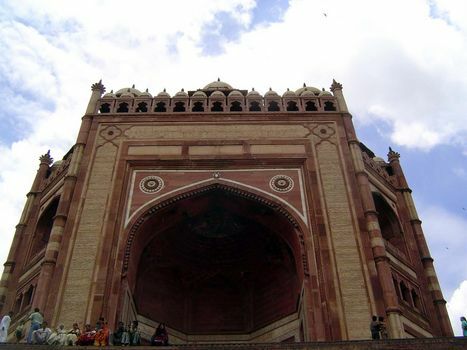 Akbar's tomb. As was customary, there were two tombs: the real one--this one--and a cenotaph or ornamental tomb several stories above it. Alas, because the terraces that rise above the ground level are closed to the public, you'll have to settle for Fergusson's 19th century description. Above the ground level, he writes, "stands another far more ornate, measuring 186 ft. on each side, and 14 ft. 9 in. in height. A third and fourth, of similar design, and respectively 15 ft 2 in. and 14 ft. 6 in. high, stand on this, all these being of red sandstone. 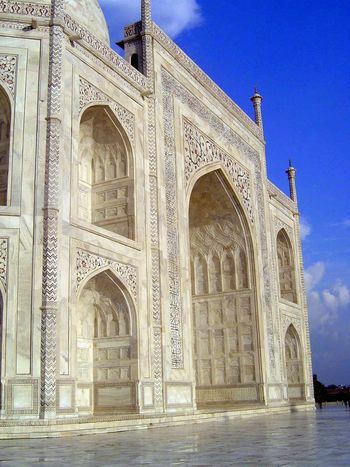 Within and above the last is a white marble enclosure 157 ft. each way, or externally just half the length of the lowest terrace, its outer wall entirely composed of marble trellis-work of the most beautiful patterns. Inside it is surrounded by a colonnade or cloister of the same material, in the centre of which, on a raised platform, is the tombstone of the founder, a splendid piece of the most beautiful arabesque tracery." Fergusson went on to speculate that a dome had been intended to cover the cenotaph but had never been built. Equally likely, the idea was that a tomb open to the sky was closer to God than one under a roof. A cloudy day. What happens if it rains? Amazing things. Here's the view back from the tomb to the entrance gateway. 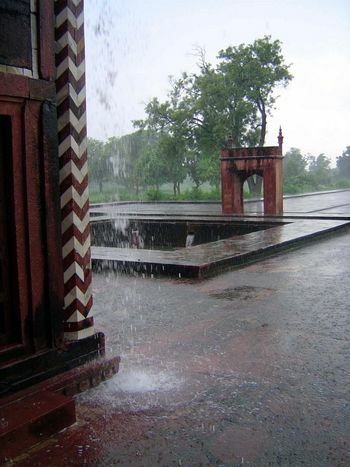 A sudden shower, and waters pour down from the upper terraces. The drains, usually dusty, suddenly turn into cascading rivers. 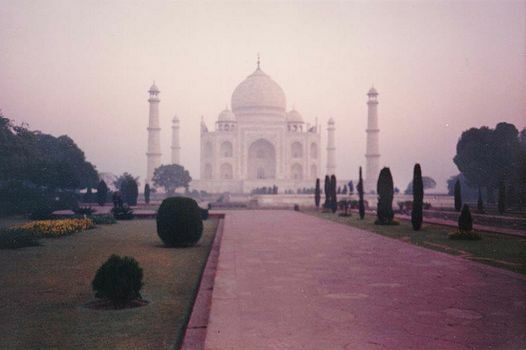 A few miles further: some visitors, like Aldous Huxley, have disliked the Taj Mahal--thought it gaudy. Others have avoided it for fear of crowds and touts. But it sits there--no, floats there--waiting. 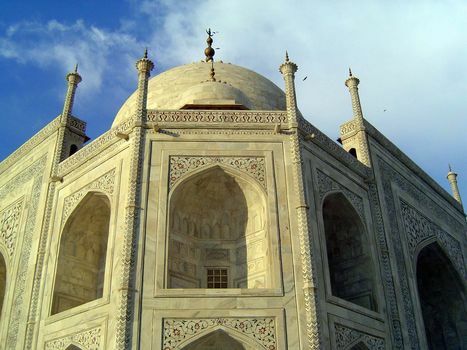 Perhaps it was built by Shah Jahan as a monument to his favorite wife, Taj Mahal ("crown of the palace") or, as she was also known, Mumtaz Mahal ("jewel of the palace"). She died at age 38 in 1631, after delivering her 14th child, and Shah Jahan's hair is supposed to have quickly gone gray. 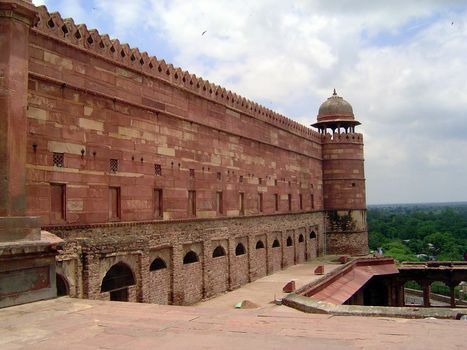 Some suggest, however, that the building was conceived as the tomb of the Ruler of the World, which is what "Shah Jahan" means. It just happens that Mumtaz died long before he did. 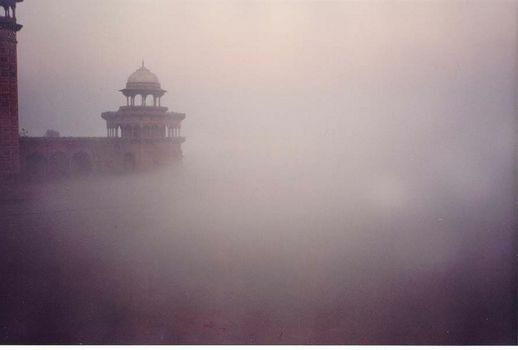 Early morning fogs drift in from the Yamuna River, just a few meters behind the Taj. 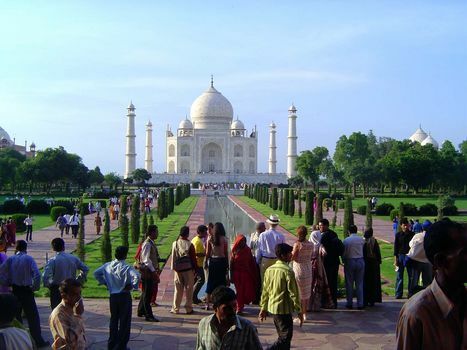 Access to the Taj was originally by boat, not the land route used today. The southeast minaret at sunrise. The structure is of white marble whose color changes profoundly in different lights. 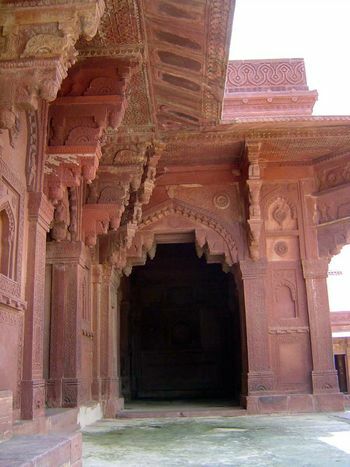 Shah Jahan had it quarried at Makrana, in Jodhpur. The more typical visitor's experience. There are two domes, by the way, with a dead space between. 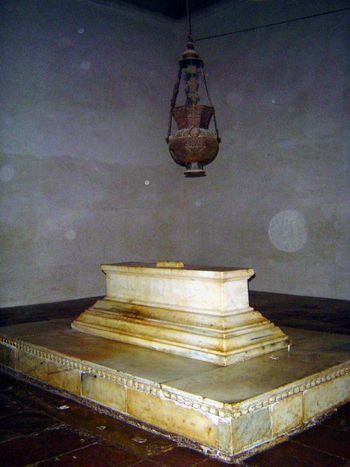 The roof inside the tomb, in other words, is not the roof seen from the outside. The building in bright light. The design is square, with the corners chamfered or cut away. 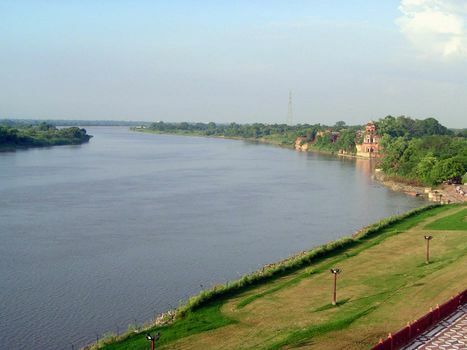 The view over the Jumna (or Yamuna) River. Delhi is a hundred miles upstream; the confluence with the Ganges is at Allahabad, twice that much and more downstream. 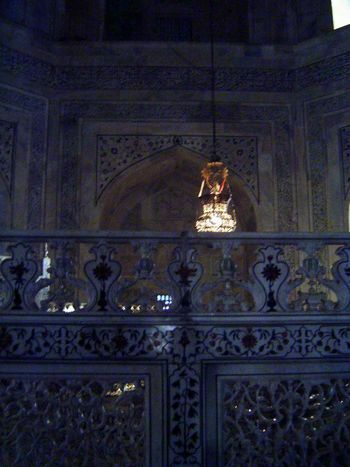 The cenotaph is screened by marble trellis-work (jalis). The hanging lamp was ordered from Cairo by Curzon, who as viceroy took a serious interest in Indian antiquities. Heaven knows who ordered up the wretched light bulb. 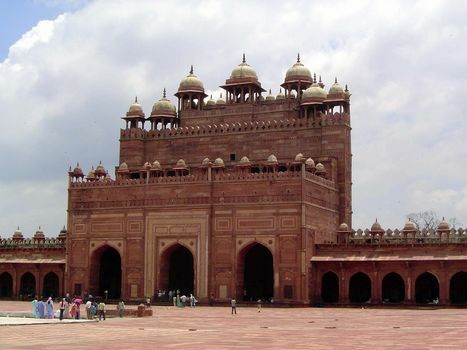 An hour's drive west of Agra--assuming you can avoid the traffic jams, which can be fierce--you come to Fatehpur Sikri, the city that Akbar built as his capital. 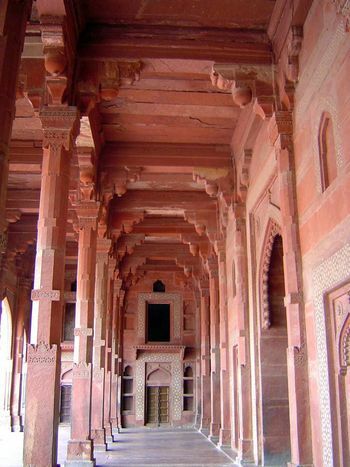 It's mostly built of massive red sandstone, as if you needed to be told. 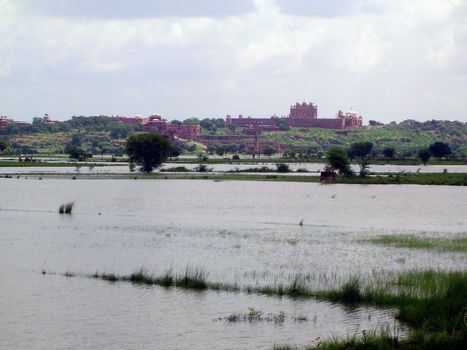 There had been a place here before, a village called Sikri. 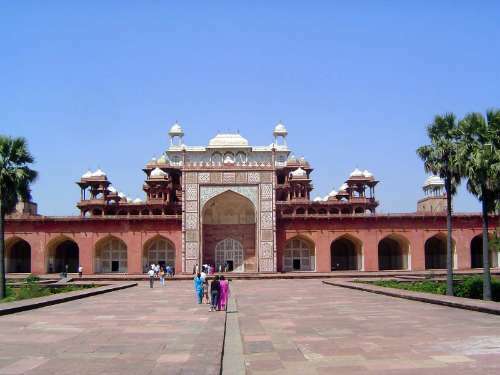 Akbar added the Fatehpur ("victory place") but left 15 years later, as suddenly as he had arrived. 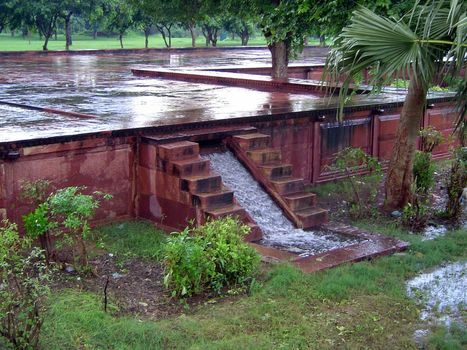 Some say this was because of acute water shortages, others because Akbar was more or less evicted by the same holy man, Shaikh Salim Chisti, whose prophecy of a royal heir had prompted Akbar to build his capital near the holy man's hermitage in the first place. According to this theory, the shaikh found the bustle of the new city too disturbing. The eastern entrance to the city. 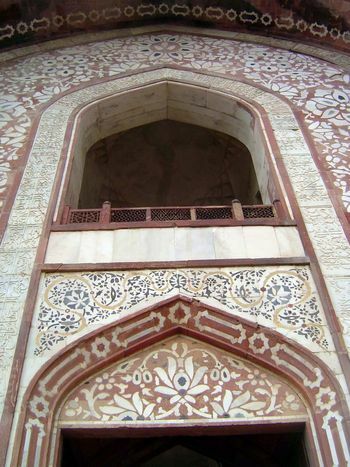 The exterior wall of the city's great mosque. 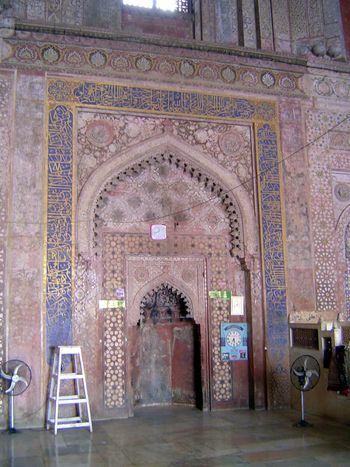 The Buland ("lofty") Gateway or southern entrance to that mosque. It's at the top of a hill and approached by stairs. 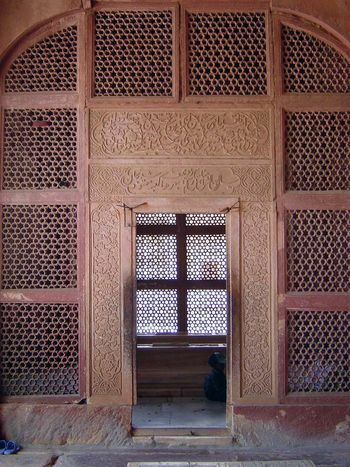 The same Buland Gateway from the inside. It must rank as one of the world's great false fronts. 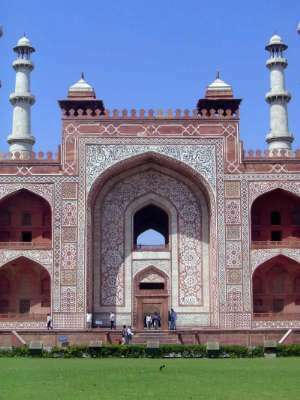 Fergusson measured the mosque at 477 feet north-south and 544 feet east-west. The view here is toward the east, with its smaller entrance. Under this courtyard are cisterns or reservoirs: water was always in short supply here. Looking west to the qibla, which gives the direction of prayer. 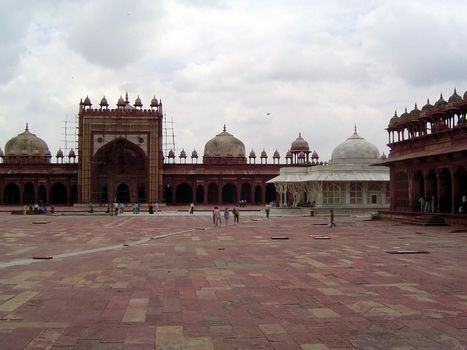 The white tomb is that of Salim Chishti, at whose behest Akbar built Fatehpur Sikri. The qibla up close, the usual modern excrescences. The effect is to reduce the blindingly white light. 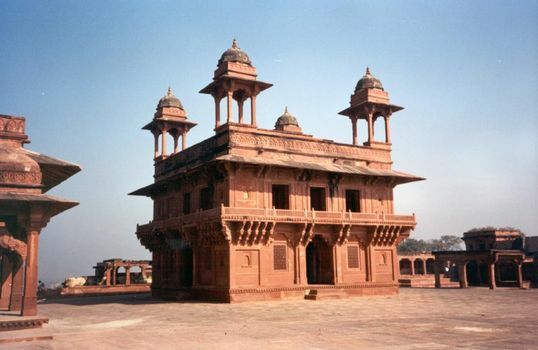 The most unusual building in the city is this supposed Diwan-i-Khass, or Hall of Private Audience, with its four rooftop kiosks or chhatris. 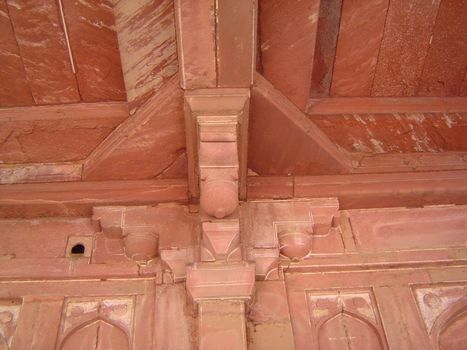 They are distinctively Hindu, as are the brackets supporting the balcony. 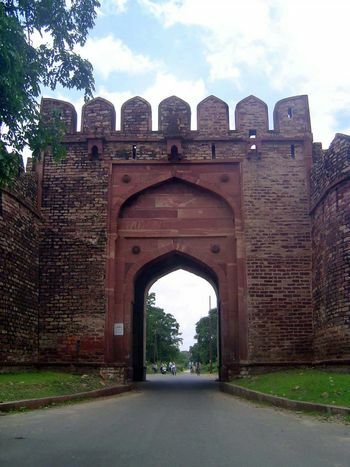 Perhaps these borrowings reflect Akbar's efforts to fuse the religions of his domain: he was unusually tolerant of Hindus and other non-Muslims. 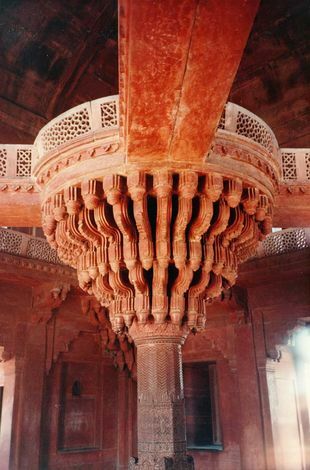 Inside, there's only one room, with this ornately corbelled column, atop which Akbar is said to have sat in council, master of the four quarters. There are other interpretations, more favored these days: the building, for example, is said to have been purely symbolic, with the central column representing the cosmic axis and with the squared design symbolizing the four corners of creation. 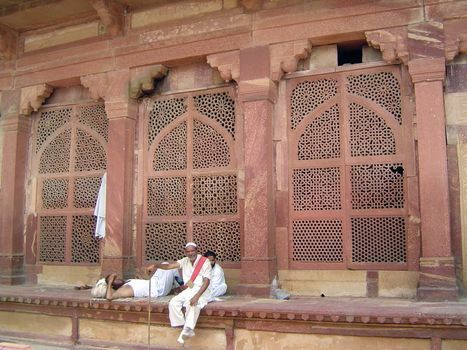 The jalis, those pierced screens forming a balustrade, are restorations--obviously so, once it's pointed out. 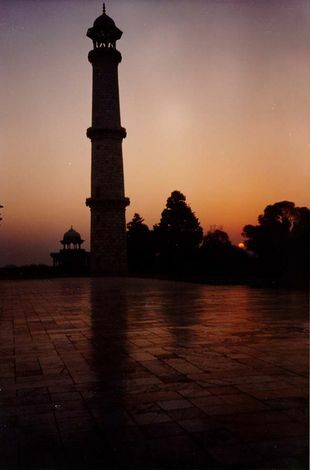 The Hiran Minar ("deer minaret" or, alternatively the tower of the harem) is on the north side of the city. 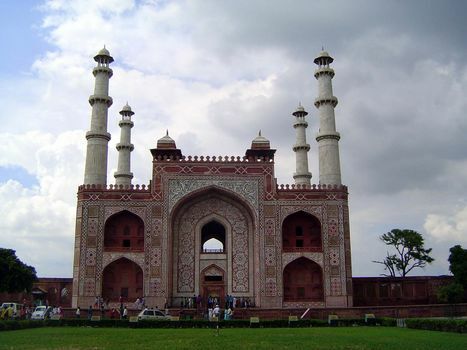 Akbar is said to have sat up top, shooting deer driven to its base. 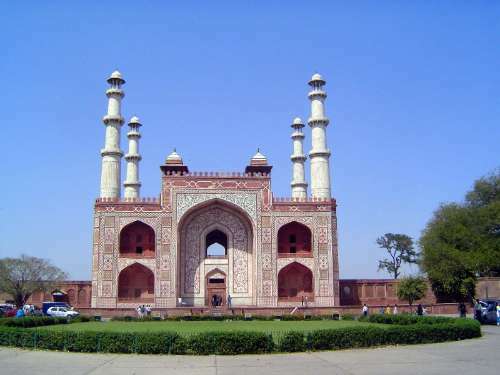 The tower studs, of stone but in the shape of elephant tusks, are supposedly a reference to Akbar's favorite elephant, buried at the foot of the tower. 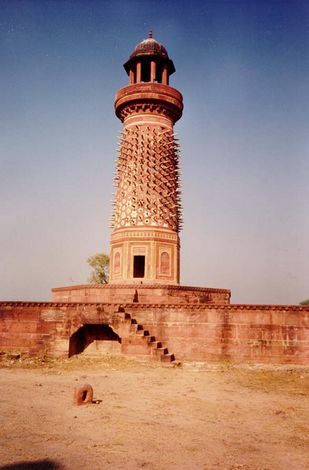 More likely, the tower was a milepost, a kos minar,lit at night. The "tusks" were probably used as poles on which lights were hung--or, more luridly, on which the heads of thieves were piked. There's no shortage of speculation.